A 1 km section of the trail in the Maitland Woods will be transformed by the candlelight. After the walk, come in to enjoy a hot cider or cocoa and a cookie (coin donation). The MTA organizes this annual event as part of the Town of Goderich’s Winterfest, and it is always a magical adventure. Participants can set out from the trail entrance at the east end of the Columbus Hall parking lot (Parson’s Court) anytime between 7:30 and 8:30 pm. Everyone is encouraged to bring their own lanterns and set them out somewhere along the trail prior to 7:30. Come and find out for yourself why people are eager to take part year after year after year! Volunteers are welcome. Call Con Melady at 524-8730 if willing to help light the trail, or assist with serving refreshments. Kick-off to Goderich Winterfest 2019! Come make your own lantern to help light the trail! Attend one or both lantern making workshops at the Parks Department Shed on Parsons Court. Please register early for the workshops to prevent cancellation and ensure a space by calling or texting Paula Harris. If you leave a message include your name, number of participants (adults/children), contact information and which day(s) you prefer. Costs are $10 for a regular lantern or $15 for an oversized one, payable to Paula at the workshop. All are welcome including children with a hands-on adult helper. The finished lanterns can be placed in Maitland Woods during the day on Friday, February 1st to help light the trail. 2017 was our 23rd Anniversary of the Candlelit Walk! This fun event is part of Goderich’s Winter Festival which is always on the first weekend in February. Participants of all ages set out from the trail entrance at the east end of the Knights of Columbus Hall parking lot off Parson’s Court anytime from 7:30-9:00pm. 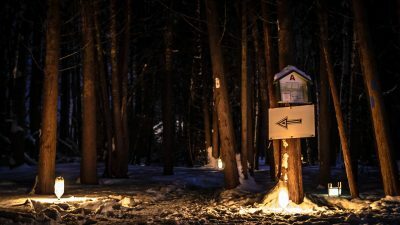 A 1 kilometre portion of the Maitland Woods Trail is transformed by the flickering beauty of candlelight and handmade lanterns hanging in the trees. Everyone who has their own candle lanterns (home-made or bought) is encouraged to add to the magical experience by bringing them and setting them out somewhere on the trail. Many of the unique lanterns lining the trail are the result of the efforts of an artisan in our group, Karen Melady, a local artist dedicated to community art projects. In preparation for the walk, Karen holds 2 lantern making workshops in January. Watch for details about the workshops in the MTA newsletter. After the walk, come in to the Hall to enjoy a cup of hot cider or cocoa and a cookie. We hope to see you there! About 30 volunteers are needed for this event. If you’d like to help out, send us an email. The site of the trail is the Maitland Woods, a local wetland within the town’s boundary and adjacent to our industrial park. For the last 19 years, the MTA has been providing a unique experience of a winter woodland walk by candle light. With the support of a Community Art Project, the youth-driven Community Rebuild Team, and an arboretum enthusiast, the event continues to gain interest. The cooperation of these diverse groups has succeeded in creating an increased awareness of this woodland within our community, and has had significant impact on stemming development in the area. Building awareness of this urban wilderness is the first step in ensuring that it is valued by residents. Encouraging people to be outside and walking is a way to keep healthy and happy, and to protect these special places.